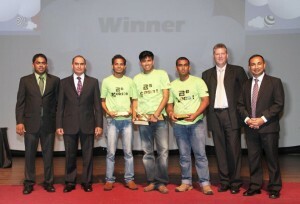 Some said, Imagine Cup Sri Lanka deserves to be in the IT Faculty. Some said this time it’s IIT going to win as they got 16 teams out of the 32 or 33 local finalists. Some gave “Pora talks” saying with a gadget on the arm, they can save the lives of blind. Some asked how a team of 3 with one being suspended can win over with such a morale. Things went upside down sometimes when felt the danger of being disqualified at a point. We had enough stuffs to laugh at with some advises by genius on showing impressions on Facebook. Missing a member who cared that time as a brother was another. But we had a cool captain who did not give a damn about odds against us and a designer who was hardworking. With a mentor who was not only a mentor at sometimes, we came to the local finals. round yet we realized why Sri Lanka is still developing and others are developed considering the feedback of the judges. The only conclusion I got is Sri Lanka is way far behind development not only because of the GDP, but attitudes, thinking and capabilities on sacrificing on somethings. T Faculty became part of top 3. IIT had 16, yet one got a runner up place even more disagreed on that. It was the 10th Imagine Cup Worldwide finals and Microsoft has done a great job on making it colorful, joyful and interesting for the attendees. Met lot of awesome people from variety of countries, cultures and things we shared with them were really valuable. In conclusion I would say, “You can beat local judges even with a technically not feasible solution. The local CEOs and CIOs are not that aware of technology. But the Q and A sessions you face in the worldwide finals are the greatest verbal slaps you can ever get”. That is the best IT competition in world. Nobody else can do something like that.